Encapsulation of the Sky Muster satellite is shown in the Spaceport’s Ariane 5 Final Assembly Building. At left, the fairing is prepared for lowering over Sky Muster and the SYLDA multi-payload dispenser system on which it is mounted (photos at center and right). 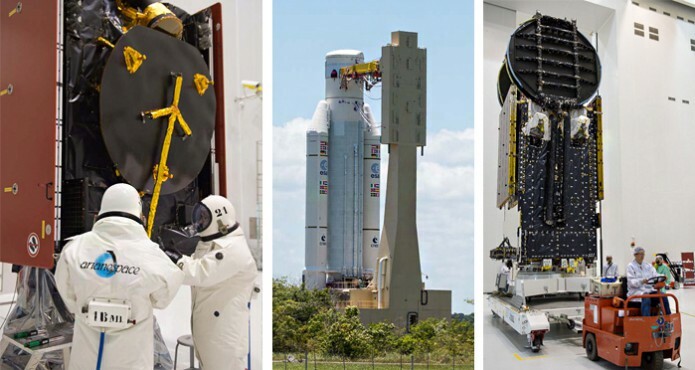 Payload integration activity for Arianespace’s next heavy-lift mission from French Guiana has moved into the Ariane 5’s Final Assembly Building, where both of the mission’s passengers – Sky Muster and ARSAT-2 – are being readied for liftoff on September 30. An integration milestone occurred with the encapsulation of Sky Muster and the SYLDA dispenser in Ariane 5’s payload fairing. This step prepares the upper component for installation on Arianespace’s workhorse launcher, positioning it atop ARASAT-2 once the lower passenger is installed on Ariane 5. The winning drawing in a competition to name Australia’s Sky Muster satellite was created by six-year-old Bailey Brooks, and is included on the Ariane 5 payload fairing for Arianespace’s Flight VA226. The Sky Muster satellite will be operated by Australia’s nbn™, which held a contest to name the communications spacecraft. School children were asked to provide an original painting or drawing that illustrates how the nbn network will make Australia a better country. Six-year-old Bailey Brooks was the national winner, whose drawing has been reproduced on the Ariane 5’s payload fairing. She and her Alice Springs School in Australia’s Northern Territory also provided the Sky Muster name for nbn’s spacecraft. Sky Muster is the first satellite to be orbited by Arianespace for nbn, which is owned by the Commonwealth of Australia. The service provider’s key objective is to ensure all Australians have access to fast broadband as soon as possible, at affordable prices and at the least cost to taxpayers. Built by Palo Alto-based SSL (Space Systems Loral), Sky Muster has an estimated liftoff mass of 6,440 kg. and will operate from geostationary orbit. It is designed to deliver broadband services to more than 200,000 rural and remote Australians, providing coverage to the entire country, including the Norfolk, Christmas, Macquarie and Cocos islands. A second nbn satellite also is scheduled for launch by Arianespace on a future mission. Arianespace’s Ariane 5 mission on September 30 is designated Flight VA226, signifying the 226th liftoff of an Ariane vehicle from the Spaceport since this series of European launchers began operation in 1979. It will be the fifth Ariane 5 launch of 2015, and the ninth of 12 flights planned this year by Arianespace utilizing its family of the heavy-lift Ariane 5, medium-lift Soyuz and lightweight Vega. Riding with Sky Muster on Flight VA226 is ARSAT-2, the second in the series of geostationary satellites to be orbited by Arianespace for Argentinian operator ARSAT. After its launch, ARSAT-2 – which has a liftoff mass of approximately 2,975 kg. – will provide direct-to-home television (DTH), Internet access services for reception on VSAT antennas, along with data transmission and IP telephony.